Perfect guide to dog ownership. It's great when your dog chews its own toy. But when dog chewing starts to focus on your possessions and household items it can be the beginning of a lifelong problem. Most dogs have a natural desire to chew. Dog chewing passes their time and it's fun. If a dog is bored, lonely or nervous chewing gives them an outlet. It's like comfort food for people and is quite soothing to an anxious dog. When dogs are under exercised, dog chewing gives them a way to burn up nervous energy and also gives them something to do. 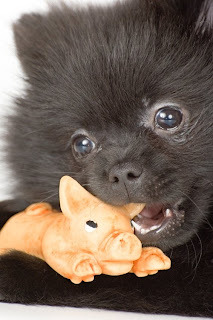 There are some easy things you can do to prevent destructive dog chewing. If you can stop your dog from getting her first jaw full of a table leg, a running shoe or a pillow you're way ahead of the game because after her first chew she'll go after those things in the future. So confine her to a dog-proofed area such as a crate until you are sure she understands your rules. Keep things out of reach. Since dogs like to explore the world with their mouths it's up to you to keep things out of reach. Common targets in your home include shoes, clothing, books, eyewear and garbage along with small cameras, remote controls and cell phones. Make them inaccessible to her climbing, jumping, and standing on her back legs. Give her lots of tasty alternatives to your things. Remember that most dogs love and need to chew. If she's a puppy (less than a year old) or an adolescent (under three years old), her needs are even more pronounced. So it's time to go shopping! Get a big variety of toys and give her two or three at a time to play with. Keep things novel and interesting for her by changing her toys every several days. These three ideas are a good start. And for the one thing you always need to do to stop dog chewing see 7 Ways to Stop Dog Chewing. For more great tips about training your dog, take a look at http://www.DogObedienceTips.org now. (c) Copyright - Steve Schulman. All Rights Reserved Worldwide. How To Build Chicken Coop?